We will not be offering Cecemmana in 2019, but please consider applying for 2020. Cecemmana is a Nahuatl word that means to sprinkle and plant seeds on the earth. This program is dedicated to planting seeds in our diverse Bay Area communities for future herbalists. This 400 hour training will provide students a solid foundation in the art, science & spirituality of herbal medicine from a multi-cultural perspective. The focus of Cecemmana is to help students build a strong relationship with the plants; and to also support them to develop an intimate and healing relationship with their own bodies. We will cover the physical, emotional and spiritual aspects of herbalism and healing. 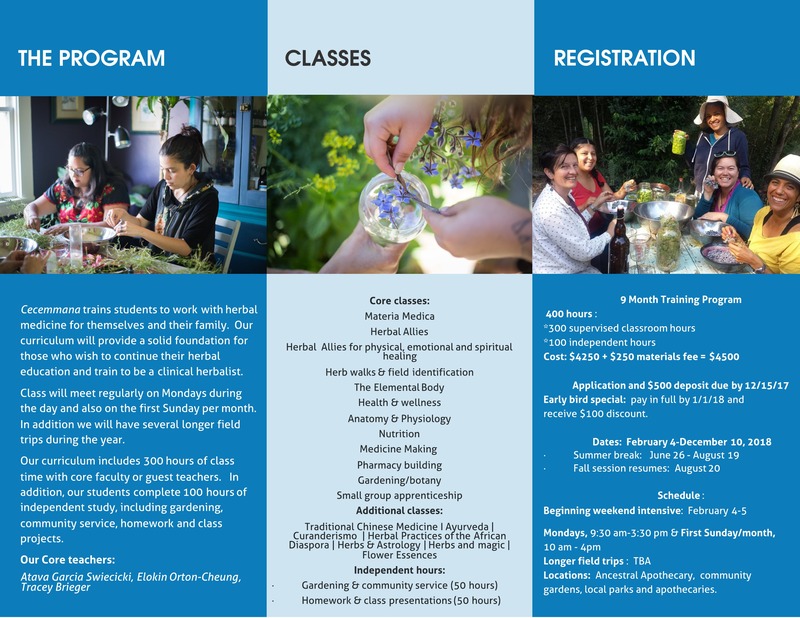 Class time will include lecture, class discussions, medicine making, herbal gardening, herb walks, field trips, and small group apprenticeship. Class projects include a long term study of one herbal ally, and researching and presenting a project for each student’s ancestral medicine. Cecemmana will give our students the skills to work with herbal medicine for themselves and their family. This is not a clinical herbalist training program. The American Herbalist Guild requires 1600 hours of training to become a certified professional herbalist. In this way, what we are offering is a first step for those who wish to achieve that. Our curriculum will provide a solid foundation for those who wish to continue their herbal education and train to be a clinical herbalist. Class will meet regularly on Mondays and also on the first weekend per month. In addition, we will have two longer field and camping trips in June and August. Our curriculum will include both 300 hours of core classes and additional classes in special topics. These 300 hours are either taught or supervised by our core or adjunct faculty. In addition, 100 hours is independent work in which students will be gardening, volunteering, or working on school projects. Locations: Ancestral Apothecary office; home office & garden; out in the field; community gardens.